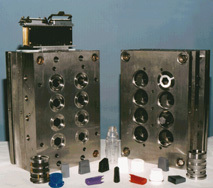 Just one of the great advantages offered to our customers is our Modular Molding System. This system uses modular hot runner molding systems that limit the cost of new tooling to insert sets only. The Laser Modular Molding System follows the production curve by utilizing multiple frames that accept the same cavity inserts. Prototyping can be done with a one cavity base in a small press. When initial orders come in you add to that same cavity and move to a larger 4-8 cavity tool to keep up with the increasing demand. These same cavities can be moved to a 64 (or more) cavity tool when the product hits the peak of sales. Utilizing the Laser Hot Manifold System and the standard components available, we can customize a modular system for your product needs and keep the turnaround time half that of a custom complex mold. The price too. This will let you focus on your products and customers, not costly injection molds that may become obosolete within 2 years. Please visit our Contact page for the 6 easy ways to contact Laser Tool & Plastics and make your operation produce top quality, American made products at an affordable price.